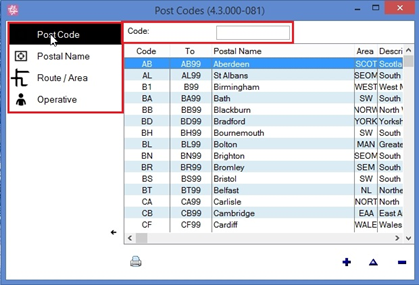 Within Enterprise, you can define the post codes ranges which apply to each area you currently do business in. 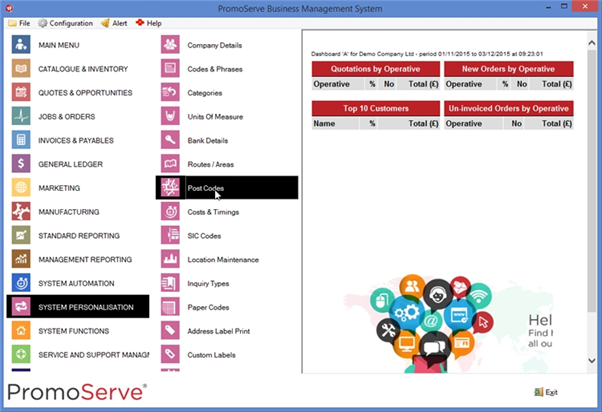 This allows the system to define location information based on the post code. 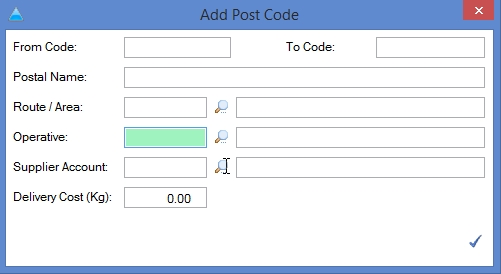 To add post codes to the system, click the blue plus icon in the bottom right of the screen. This produces the ‘Add Post Code’ form. On this form you can specify the entire code range for an area (for example, in Sheffield the range would be From: S1 To: S99.) In cases where the code is prefixed by two letters, you only need to specify this letter prefix in the ‘from’ field. (For example, Cambridge From: CB To: CB99). The postal name is the name you wish to give to this range of codes (It is usually advisable to designate this as the geographical area for easier reference later.) You can also specify the county / area this code applies to (i.e. Yorkshire & Humberside, Channel Islands, International), a specific operative if one is assigned to the particular area, and the supplier if you have a specific supplier for a geographical area. You can also define a delivery cost in kg for shipping. To modify an existing code, highlight the entry you wish to alter and click the blue triangle towards the bottom right of the screen. Similarly, to delete an existing code highlight the code and click the blue minus sign in the bottom right (the add, modify and delete buttons are side-by-side).